Sundays Xtra is standing at stud at Sunspot Appaloosa Sport Horses (Papakura, Auckland, New Zealand). 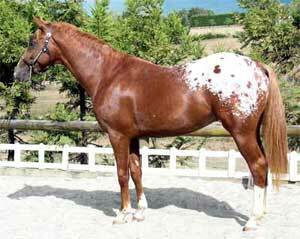 He has a snowcap with dark spots, giving a spotted blanket pattern. He's 15.2hh at 2 years, with superb movement. A combination of some of NZ's best bloodlines. Winner 2yr Sport Horse class at the Royal Easter Show. Many thanks to Carole Davis for allowing me to display a photo of this beautiful and well proportioned stallion.